AFC have their first trophy of the season in the bag. Alvechurch FC have already secured their first piece of silverware of the 2018/19 season, winning the Worcestershire Senior Cup for the first time in 41 years. Having beaten a very youthful Kidderminster Harriers side 6–0 in the semi final at Lye Meadow, they faced a much stiffer test against fellow Evostik Southern League Central side Redditch United at Evesham United’s ground. With ’Church dominating the majority of the match, a brace from Josh March and a spot-kick from penalty king Tom Turton sealed an impressive 3–1 win. As we went to press, Alvechurch were due to meet Redditch again, this time in a home league match – this has been swapped with the reverse fixture on Boxing Day which will now be played at Redditch as their 3G pitch is better equipped for potential wintry conditions. There was also more cup action to come as AFC were due to play Bromsgrove Sporting in the Preliminary Round of the FA Cup. Meanwhile, the league campaign began with two draws against Royston Town and Tamworth, and a defeat to Coalville Town. * ’Church received a major pre-season boost with the re-signing of midfielder Babucar Sauane. Fans’ favourite Baba left the club at the end of last season and joined up with the Jamie Vardy V9 project before going on trial at Blackpool FC. Everyone at Lye Meadow is delighted to see Baba back in his pivotal role. Manager Ian Long also made several more new signings, including 18-year-old midfielder Theo Llewellyn, a former Bristol City scholar who has represented Wales at U16 level and was a squad member of their Victory Shield-winning side. 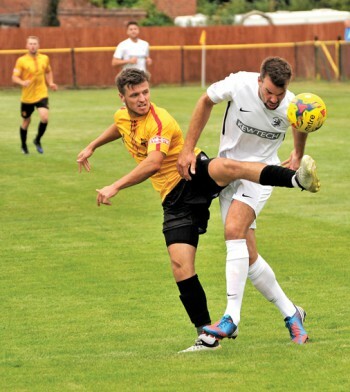 There are also three new players who began their careers at West Bromwich Albion, including experienced midfielder Aaron Birch, who went on to play a major role at Hereford FC as they won the Midland Football League at Alvechurch’s expense in the 2015/16 season. Taylor Morrison has joined the club from West Brom’s U21 set up and is a pacy left-sided forward. Jordan Piggott, a 19-year-old centre back, also started his career at the Albion before playing in the Scottish leagues, representing both Dundee FC and East Fife. Another new face is Johnathan Onyeaka, who has signed dual forms with Nuneaton Borough FC. The six-foot-four-inch centre back includes National League side Solihull Moors and US team Jersey Express among his previous clubs. * As Alvechurch has moved up the non-league pyramid, larger crowds are anticipated – so some extra volunteers are required. The club is looking for bar staff to go on a rota, for around two to three hours every three weeks. Car parking stewards are needed for a couple of hours perhaps once a month, and match day stewards for one match a month. You’ll get a pie and a pint as well as a match ticket! If anyone is prepared to lend a hand, please contact the club.